BIG3 has released the season’s full schedule and coach pairings for each team. Read more after the jump. 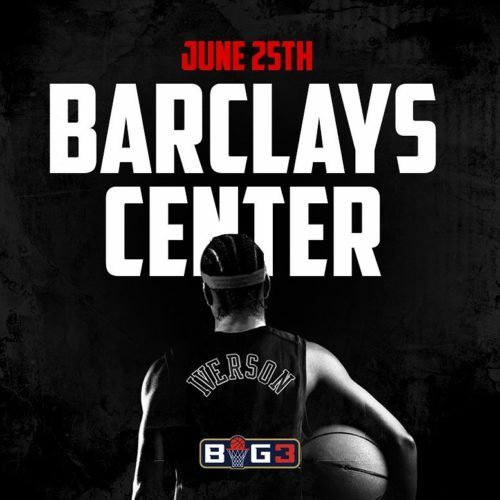 “The BIG3, the highly-anticipated 3-on-3 professional basketball league, has un-veiled its full 10-week schedule. The season will tip off June 25 at Barclays Center in Brooklyn, NY, followed by reg-ular season stops in basketball hotbeds Charlotte, Philadelphia, Tulsa, Nashville, Dallas, Lexington (Ky.) and Los Angeles. The BIG3 Playoffs will bring professional basketball back to Seattle on Aug. 20. The inaugural season Champions will be crowned in Las Vegas on Aug. 26. Fans across the country finally can see some of their favorite players up close and in person again. Whether with family or friends, this electrifying new league will take centerstage all season long and create a one-of-a-kind live ex-perience and appointment television every week. The BIG3 games in Philadelphia will mark the return to the city of NBA Hall of Famers and Philadelphia 76ers icons Allen Iverson and Julius ‘Dr. J’ Erving. In addition to bringing basketball back to Seattle, the league playoffs will pro-vide Seattle fans the chance to see SuperSonics legends Gary Payton and Rashard Lewis. Other stops will include Rupp Arena, the most famous college basketball venue in the country, and Los Angeles’ Staples Center, home to the Los Angeles Lakers and Clippers. 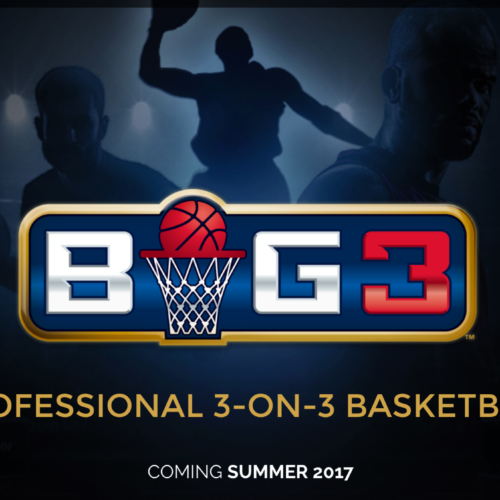 BIG3 games will be played every Sunday in a different city, in a quadruple header at the same venue. Games will be presented the following night in primetime at 8 p.m. ET on Fox Sports 1 in a thrilling ‘Monday Night Basketball’ experience. The league championship will be played on Saturday, Aug. 26 and broadcast live on the FOX broadcast net-work at 4:30 p.m. ET. Tickets for most dates will go on sale May 6 at Ticketmaster.com. More than 70 former NBA stars have signed on to compete for the remaining 24 spots on the BIG3’s 8 teams. Play-ers currently eligible for the 2017 BIG3 draft and vying for the remaining roster spots include: Latrell Sprewell, Steve Francis, Kendall Gill, Keith Bogans, Isaiah ‘J.R.’ Rider, Mahmoud Abdul-Rauf, Marcus Banks, Earl Boykins, Derrick Byars, Josh Childress, Brian Cook, Ndudi Ebi, Reggie Evans, Donte Greene, Shane Heal, Larry Hughes, Mike James, Ivan Johnson, Jumaine Jones, Voshon Lenard, Rashad McCants, Pops Mensah-Bonsu, Lawrence Moten, Ronald Murray, Lee Nailon, Andre Owens, Smush Parker, Jamario Moon, Ruben Patterson, Eddie Robinson, Xavier Silas, Joe Smith, DeShawn Stevenson, Mike Sweetney, Etan Thomas, Hakim Warrick, and James White. 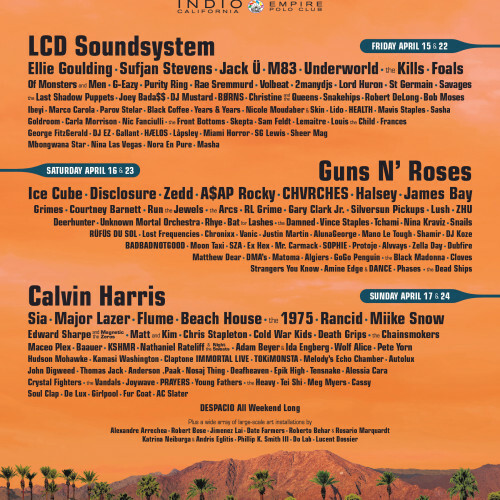 Ice Cube will be performing at this year's Coachella Valley Music and Arts Festival. Check out the full line-up after the jump.